A property damage claim is, quite simply, a report or evidence that you submit to an insurance company in the event that your property has been damaged. Property damage claims come in many shapes and sizes, and different states have different rules regarding how and when to file. If your vehicle is hit by another vehicle while parked, or if a vehicle slides off road and damages your mailbox, lawn, home, or other property, you can file a property damage claim. As you likely know, the more information you have, the higher the likelihood that filing your property damage claim will have the desired outcome. Once you realize that your property has been damaged (if you are in an accident, that may be pretty immediate! ), make sure to call the police. If you do not file a police report, you often won’t be able to properly file your claim. Once you make the call, take as many photos as possible -- you want to be able to have proper documentation, even if the police will be gathering it as well. As tempting as it might be, don’t say anything to the police that might be construed as admitting fault for the accident. Even saying, “oh, I shouldn’t have parked my car so close to a busy road” is too much. Whose Policy Pays In a Property Damage Claim? The at-fault vehicle’s insurance policy pays to repair property damage. Even in no-fault states, the at-fault vehicle’s policy pays up. In this situation, the coverage is provided by the insurance company of the vehicle, not by the driver of the car. Example: John borrows his brother’s truck to pick up some landscaping supplies. While backing out of his parking spot at the nursery he hits a parked car. John’s brother’s insurance policy will cover the damages to the parked car. The Insurance Research Council (IRC) estimates that 1 out of every 7 drivers in the United States is currently uninsured, yet only twenty-two states require uninsured motorist property damage coverage. Drivers in other states, of course, also have the option (but not obligation) to purchase an uninsured motorist property damage policy, which provides coverage for when someone hits your car and has no car insurance coverage. Such a policy can also provide coverage for hit and run accidents. In states where the coverage is not required, the majority leave it to the insurance companies to decide whether or not to offer such a policy. Deductibles can apply to the coverage depending on how you set your policy up. Call your car insurance agent to determine how much coverage you have purchased. An agent can also help you determine if a hit and run will be covered under your policy. How Do Deductibles Apply In a Property Damage Claim? If you hit somebody’s property with your own vehicle, your standard deductible usually will not apply to repair their damages. However, if your vehicle was damaged at the same time, you will need to pay your collision deductible in order to get your vehicle repaired. 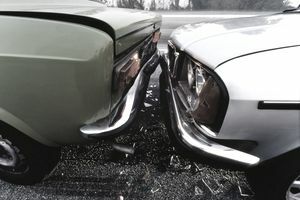 Collision deductibles can vary, but it is common for drivers to have a $500 deductible. If you know who damaged your property, you’re in luck: you will be able to file a property damage claim against their insurance policy, you will not be required to pay a deductible, and you are also eligible for a rental car while your vehicle is being repaired. If you don’t know who damaged your property, it’s a bit trickier (and potentially much more expensive): not knowing who damaged your property changes the claim from a property damage claim into a collision claim. If you do not know who damaged your vehicle, you will be responsible for your collision deductible. If you do not have collision coverage, your insurance company will not pay out for the claim. It can definitely be hard to bare. Hopefully, the at-fault party left you a note. Example: Jack comes out of the grocery store to find a large dent in his passenger side door. Nobody left a note claiming responsibility. He calls his insurance agent and finds out he has a $500 deductible on collision. He will have to pay the first $500 and his insurance company will pay the remainder of the bill. How Long Does It Take to Process a Property Damage Claim? Property damage claims can take some extra time to process. Fault needs to be determined and both parties need to be contacted by the claims department. Assuming everyone cooperates, you should receive a check for the repairs in approximately two weeks. You can speed up the claims process by ensuring you are available to speak with the claims representative. Communication is usually the most important factor when it comes to getting your vehicle repaired (and those repairs paid for) quickly. Example: Mark notified Tony that he accidentally backed into his vehicle. A property damage claim was filed under Mark’s auto insurance policy. The claims representative contacted both Mark and Tony to verify the accident. A check for the repairs was issued and mailed to Tony after 10 business days. Does a Property Damage Claim Affect Your Future Rates? If someone hit your property, filing a claim on someone else's car insurance policy will not affect your rates. If you do not know who damaged your vehicle and you file a collision claim under your own policy, it will most likely increase your rate at renewal time. Causing an accident is never a good feeling. If you damaged someone's property, making it right can be expensive. Luckily, car insurance is in place to help you. Property damage coverage will payout, often with no deductible, which is a good thing. If there is damage to your vehicle too, you will have to pay your collision deductible in order to get it repaired. A surcharge will most likely be added to your renewal for filing an at-fault accident. The dollar amount of the surcharge can vary. Check with your car insurance agent to get more details.